In this challenge you must avoid eating any fried food for this entire week. There are multiple disadvantages for consuming fried food. A few examples are: increased stroke, diabetes, and cancer risks. Many of your favorite recipes can be modified from frying to baking or sautéing using very little or no oil. Fried have little to no nutritional value. Friend foods are drenched in unheatlhy oil-most commonly used are Canola, Cegetable, or Peanut oil-that are not good for your body. These oils become even more harmful for you when they are heated at such high temperatures to cook your food. Some alternatives to frying foods are steaming, baking, or toasting your food. 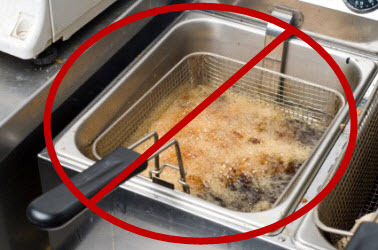 Why Frying Food Is Unhealthy - Learn more.